5 Stars / Apple Tree, The / Birds and Other Stories, The / du Maurier, Daphne / Short Stories / Tuesday Terror! This is a fine example of what du Maurier does best – creating a chilling atmosphere just bordering on the supernatural but never clearly crossing that line. Although the story is told in the third person, we see it unfold through the widower’s eyes, giving it the effect of an ‘unreliable narrator’. If Midge was as the widower saw her, then his happiness at her death is understandable. But how much did he contribute to making her what she became? We catch glimpses of the young woman she once was, trying to please the husband she loved and having her enthusiasm stamped on by this man who clearly looked down on her. Is the widower to be pitied or condemned? And is the story one of a ghostly haunting or of self-inflicted psychological horror brought on by guilt? NB This book was provided for review by the publishers, Little, Brown and Company. book review, daphne du maurier, horror, the apple tree, the birds, the birds and other stories, tuesday terror! FictionFan – Yes, indeed. Trust du Maurier to create that eerie, chilling atmosphere that gives the suggestion of something looming ‘out there’ without, as you say, crossing the line. And I’ve always found her writing style so excellent. I think part of the power of her work is also that she invites readers to use their imaginations, which to me adds to the suspense. Yes, the suggestion is much more effective than descriptions of gore etc. I read a lot of her books when I was younger but don’t think I’ve read any of her short stories – looking forward to the rest of the collection. I’ve never read Daphne Du Maurier although she’s one of those names that always seems to be floating around in the ether. Your review has sold me. I think I’ll finally give her a read. 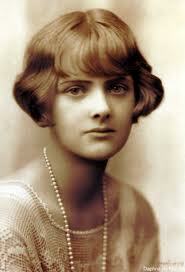 It is amazing how many of Daphne Du Maurier’s stories have not only been turned into films but very good films at that: The Birds, Don’t Look Now, Rebecca, and Jamaica Inn. Margot is right in writing that, “the power of her work is also that she invites readers to use their imaginations, which to me adds to the suspense”. You will be too young to remember this but there was a Friday night ITV series under the heading of ‘Don’t Watch Alone’ during the 1970s. It was always a double bill and i’m sure that is when I first saw Hitchcock’s ‘The Birds’. The chap without eyes haunted me for years. Oh! This seems like a goodeth one. Humph noodles. I’m so curious about the ending. How long is the story? And doesn’t the author look sweet. No, this one was sweet. One that you’ll really, really, really want to read, I bet! Hmm…are you being sneakily rude to FF? How so? You must think on a different level, or maybe I am. Nah, I can’t think like that, but I am dull. The Professor is not dull! He’s as sparkly as a Hogmanay fireworks display on a clear night! Oh yes, yes and YES we are in total accord here FF – a wonderful writer, and through understatement, careful craft and sheer writerly magic, a definite cold spooky icy breath down the back of the neck. I think, I just think, this may be a MUST of a re-read. Thankyou for the happy alert. I agree absolutely with what Margot says, she engages the READER’s imagination and makes you do part of the work in spooking yourself. The lesser writer does too much of the work and often spells each howl or drop of gore out in stultifying detail so that there it gets done to death. Off to rummage for this to be added to the TBRR (or even TBRRRR pile! Sadly it seems to have disappeared from NetGalley – which is odd because it doesn’t say it’s been archived. I was hoping to pop back in and get Rebecca which was also on offer at the same time, but it also seems to have disappeared…spooky!!! Oh blast (the disappeared Du Mauriers from the Galley – I’ve been avoiding NG a bit as I have all these impulse-from-bloggers-and-reviewers bought books to wade through) I was so cross at NO Du Maurier that the only solution was to make pancakes. And eat them. Huh! You should have posted me a couple…or three. Yes, shame about the disappearing du Maurier’s – they weren’t on for very long. Oh well! du Maurier has a gift for taking ordinary situations and using them to unexpectedly drop ice cubes down one’s back. Thanks for an excellent review. Thanks, Susan! Yes, she’s great at creating an atmosphere – more chilling than gore. I’ve read Rebecca but haven’t read these stories. She’s such an evocative writer, so gifted at setting a mood. I will be reading these stories, thanks for the suggestion. ‘Rebecca’ is the only of her books that I’ve read, but you’ve inspired me to find some of her other tales – not sure why I haven’t, actually, because ‘Rebecca’ is a favorite. Such a brilliantly eerie book! I love the film too. I must re-read some her other stuff myself – it’s been ages since I did. I hope it does – it seems to have disappeared from NG altogether at the moment. ohhhh, I’ve never read any of her work. Must get this one immediately. It sounds superb. It’s not available at my bookstore, so I’m ordering from a fabulous new and used bookstore in Portland, OR, called Powell’s. I’m looking forward to reading it. Can’t wait to get the chills.